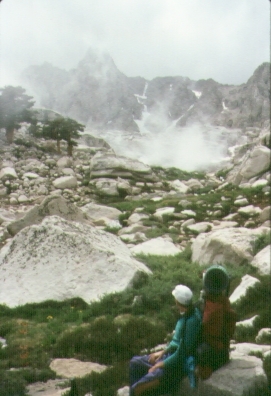 On 24 July 97 Jeff Fisher and I set out from the spring north of Meysan Lake (about 11800') to climb LeConte and Corcoran. We went over Irvine to get there because the chute from Meysan to the base of LeConte was full of iced snow and we had left our crampons behind. Ice axes would get us down in the afternoon, but were not enough to be safe at 6am. Running the ridge over Irvine is easy enough (class 2, maybe a few class 3 moves) but it's quite a bit longer than the direct route. From the saddle at the base of LeConte's north face, Secor properly corrects Roper's description of a "northwest ridge" to indicate it's a "northwest chute". Hey, between friends, what's the difference between a ridge and a chute? Then Secor says to drop 200 feet when in fact it's only 100 feet (by visual assessment and by altimeter readings)... but neglects to say which side of the saddle to drop down (it's obviously the west side). Going 200' down will seriously disappoint you! Rounding the corner southward (into the chute), you immediately see a waterfall. Secor says there is a "15-foot class 3 pitch is encountered just below the summit", when it fact it is 80 feet up a 300 foot chute and almost 400 feet from the summit. It's slightly lower in elevation than the start of the route (at the base of the north face)! Basically, it's at the bottom of the chute, not near the top. This is in fact what he calls the Waterfall Pitch, because it's the only obstacle in the chute and because it's the place where you start the traverse to Corcoran. (We removed two faded slings and a worn locking biner from the top of the Waterfall Pitch, but left one good sling in place. Oops, that's a fixed anchor... but at least there's less junk there than before!) Even in late July there was ice on the rock here, so be careful. Not to beat a dead horse, but Secor's description of the traverse from LeConte to Corcoran says to start at the top of the Waterfall Pitch. Well, not really. The obvious ledge to traverse on is 50 feet above the top of the Waterfall, and is now marked by a better duck than the one we found. From there on, the route description is perfect (including the warning about staying too high, which we did in one chute). Secor says it requires skilled route finding, but I don't think it's all that hard to find. Most of it is second class, with an occasional third class move here and there. Leave your rope behind. Back at the base of LeConte by mid-afternoon, Jeff headed over to do Mallory and I glissaded down to break camp and move my pack to the base of the second class crud route up Lone Pine. It was about 5pm when I started up 2000' of loose scree, but I got up and down with just enough time to get back onto the trail at 8:15pm (before dark) somewhere around 11000'. Secor says the chute starts at Meysan Lake. Nope. Roper is correct in describing the location of the chute as midway between the Meysan lakes (hundreds of feet elevation below Meysan Lake proper, with cliffs and boulders preventing a traverse). After grunting up this messy route, I'd agree with Harris and Clarence (report broadcast earlier) that 4th or 5th class is the way to go on this peak! Especially near sunset, the view of "Comb Ridge" (including LeConte and Corcoran) is the best reason to climb this peak unless you climb it for the route alone. The summit plateau of Lone Pine Peak is all one color. The sand, the rocks, the birds... all the same. The only contrast is provided by textures and shadows. In the sand are the tracks of a million hikers, none of whom had a clue where the summit is (it's in the back, northeast of what you first see, and you should go way around on the southeast side or you'll waste time hopping over huge boulders). There are greater and lesser use trails, and individual tracks leading at all angles between them. In all of this terrain damage, I failed to find a single mountain bike or ORV track. The technical climber's bolts also somehow eluded me. You can be sure I was looking for both very carefully! Could it be that the Sierra Club should work towards a ban on walking in sand? Or is "take only pictures leave only footprints" still valid? Do marks on rocks matter more than marks in sand?